In 1955, as the early baby boomers entered elementary school, the nation’s public school enrollment stood at 30.7 million. Sixteen years later, it peaked at 46.1 million. Then, as the boomers delayed or deferred childbearing, the school-age population began to decline, bottoming out at 39.2 million in 1984. The enrollment numbers would have changed relatively little since the early 1980s if not for the growth of the Hispanic population. Between the 1993-94 and the 2002-03 school years, the total number of children enrolled in U.S. public schools increased by 4.7 million students, from 41.8 million to 46.6 million. Hispanics accounted for 3 million of those additional students, or 64% of the increase. The number of black students increased by 1.1 million and the number of Asians grew by half a million. Meanwhile, white public school enrollment dropped by 35,000. 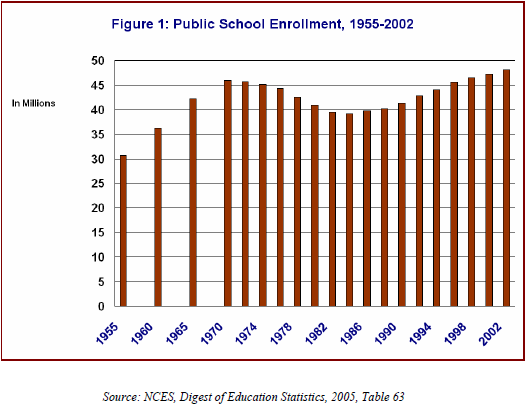 The growth in enrollment was accompanied by a building boom in many public school systems. During the 10-year period, 15,368 schools were opened; their enrollment in 2002-03 was 6.1 million—more than the overall increase in enrollment of 4.7 million.1 The increase in the number of students and schools happened at the same time, but the new students did not necessarily flow into the new schools. While Hispanic students accounted for the greatest share of the growth in enrollment, they occupied a much smaller share of the seats in the new schools. While the number of white students was shrinking, white enrollment shifted significantly to the new schools. Historical statistics suggest this is probably the most productive period for opening new schools in America since before the 1920s. 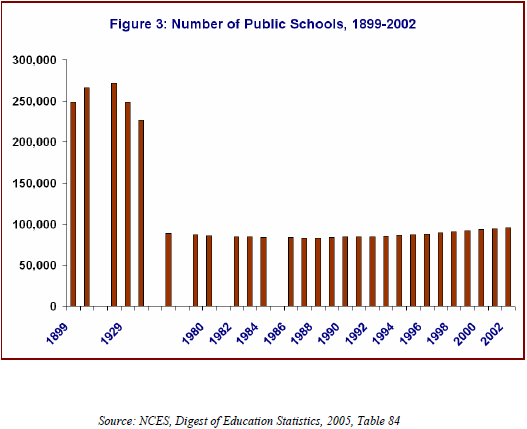 The number of public schools more than doubled from 1870 to 1900 and reached its peak of 271,319 schools in 1920. The number of elementary schools dwindled rapidly after 1920 and continued to decline until 1984. Since then, the number of elementary schools has increased by 13,000. The number of secondary schools has followed a different trend, but the recent increase in the number of secondary schools since 1992 appears to be the largest on record. By 2002, nearly 5,000 more secondary schools were in operation than in 1992. 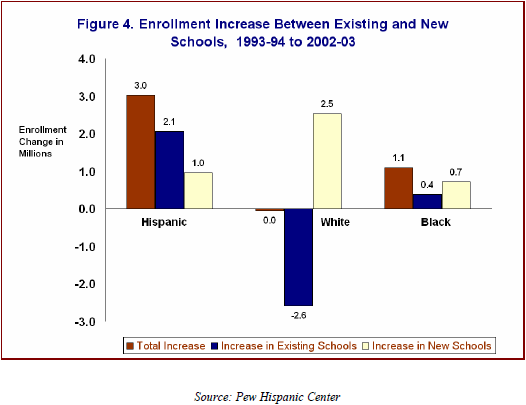 Hispanic enrollment increased by about 3 million from 1993-94 to 2002-03. 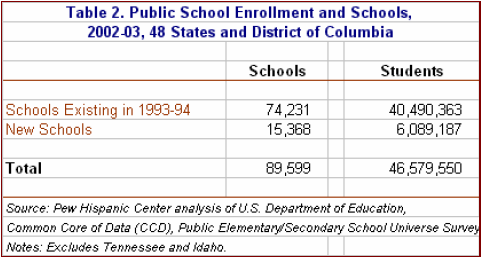 Of that increase, 2.1 million (Figure 4 and Appendix Table C1) attended existing public schools (5.3 million in 1993-94 versus 7.3 million in 2002-03). The remaining 1 million were being educated in new schools. Thus, about 68 percent of the total Hispanic enrollment increase over the 10-year period flowed into existing public schools and about one-third of the increase went into new schools. While Hispanic enrollment in existing schools increased by nearly 40 percent, white enrollment in those schools fell by 10 percent. 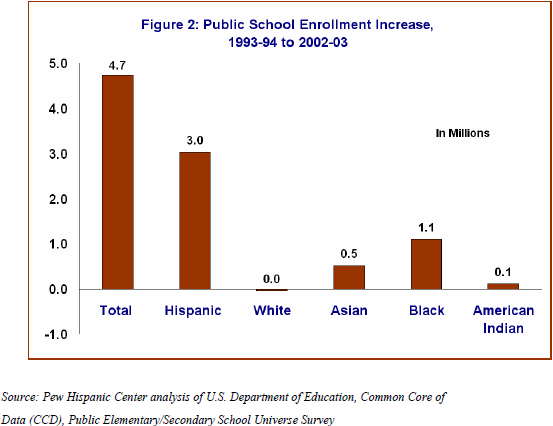 As noted above, the total number of white students in public schools changed little between 1993-94 and 2002-03. However, there was a significant shift between existing and new schools. 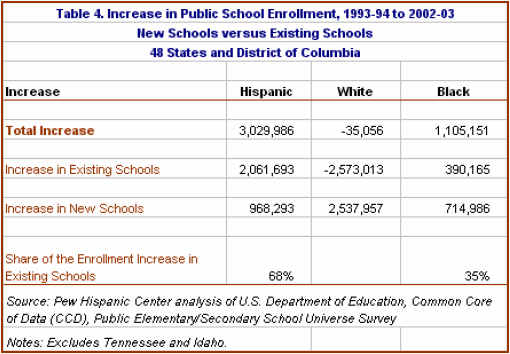 White enrollment in existing schools plummeted by 2.6 million students from 1993-94 to 2002-03. Meanwhile, at the end of this decade 2.5 million white students were being educated in new schools. A similar, though smaller, shift from existing schools to new ones occurred among black students. Total black enrollment increased by 1.1 million; 400,000 of those additional students, or 35% of the increase, attended existing public schools while nearly two-thirds went into new schools.